Sifting through social conversations to identify leads can be a daunting task, unless, that is, you are leveraging a service like LeadSift. 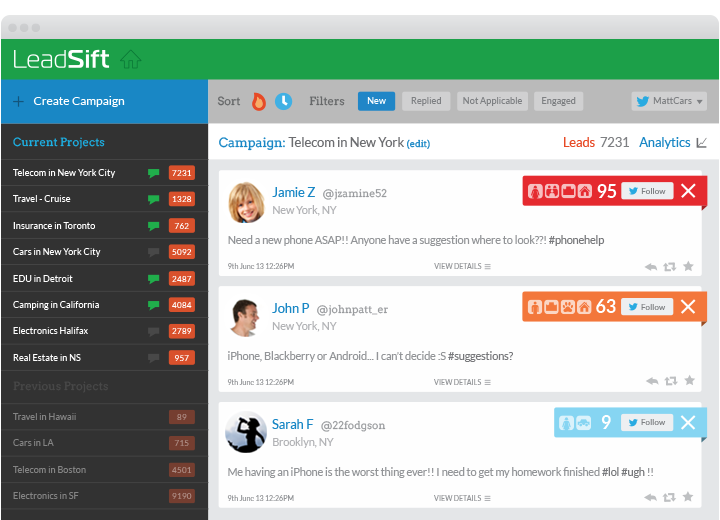 LeadSift has launched a cloud based software that analyzes millions of conversations across social media channels. This software not only identifies leads for its clients, but also gives each lead a metric, dubbed a LeadScore, that classifies intent. The LeadScore allows companies to target the best opportunity for their busines innitiatives. LeadSift’s natural language processing software users more than 50 signals to identify and score leads from social data, and labels them as “hot”, “warm” or “cold”. The score is calculated with a combination of semantic analysis of users’ posts and domain knowledge. For example, someone saying “I need a car” would be scored lower than someone who mentions a specific brand, like “I want a VW Jetta.” This is because naming a brand typically means someone is further along in the buying process as the expressed intention is more precise. Moreover, LeadSift analyzes historical conversations from a user’s public social profile to further qualify each potential lead. In addition to past posts, LeadSift leverages other available data, such as LinkedIn profiles, to extract demographic information and predict the buying power of the consumer. For example, a consumer who is looking for a new car, has a job and owns a house would receive a higher LeadScore than someone who is looking for a car but unemployed. It is also important to note that the LeadSift technology has been integrated into HootSuite’s App Directory, allowing users of the social dashboard to find and classify leads.